Our sign visible from the Post Road. 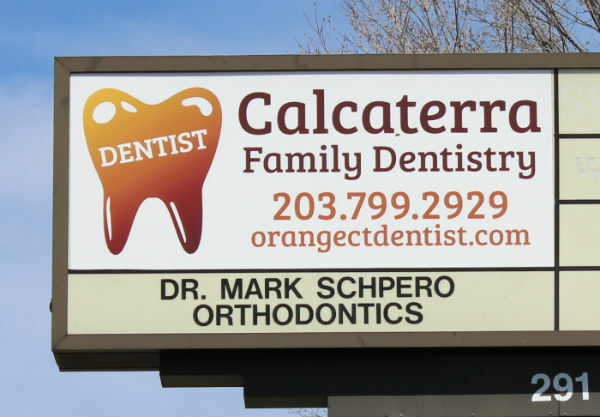 We are conveniently located in Orange, CT near the intersection of the Boston Post Road and South Lambert Road. We are in a two story professional office building on South Lambert Rd directly across from the driveway of the TGI Fridays restaurant. We have plenty of parking available in our dedicated parking lot. There is no jockeying for a coveted parking spot! Our office building has a ramp and elevator allowing for entry and exit for patients needing handicapped access. Our street address is: 291 South Lambert Rd Suite 1, Orange, CT 06477. Our office is located on South Lambert Rd directly across from the entrance to the T.G.I. Fridays in Orange. Take the Boston Post Rd into Orange. You will pass a Home Depot on your right and Ocean State Job Lot on your left. You will approach an intersection where TGI Fridays in on your right. Take a right onto South Lambert Rd next to the TGI Fridays at this intersection. Directly after making the right turn, you will see the Lambert Professional Building on your left. You will also see a small sign for a dentist. Pull into the parking lot and park. Directions from the Post Rd coming from West Haven/New Haven. Take the Boston Post Rd into Orange. You will pass Chips Restaurant on the right. You will approach an intersection where TGI Fridays in on your left. Take a left onto South Lambert Rd next to the TGI Fridays at this intersection. Directly after making the left turn, you will see the Lambert Professional Building on your left. You will also see a small sign for a dentist. Pull into the parking lot and park. Directions from Interstate 95 north or south. Take the Marsh Hill Rd exit (exit #41). Take Marsh Hill road into Orange for approximately 1000 feet. You will pass a large building housing Colony Hardware on your right. Directly after that building on the right hand side is the Lambert Professional Building. Make a right into the parking lot. If you hit the Post Rd you have gone too far.